Stoke City recorded a fourth successive goalless draw in the Championship as they failed to break down Sheffield Wednesday. George Boyd had a goal ruled out for offside for Wednesday, while Tom Edwards' curling effort went just wide for Stoke as neither side registered an effort on target before the break. Keiren Westwood made two fine saves from Bojan and Benik Afobe as Stoke upped the pace early in the second half. Westwood was again the hero late on as he saved a Bojan effort before Stoke defender Danny Batth managed to head wide in front of an open goal in the dying moments. 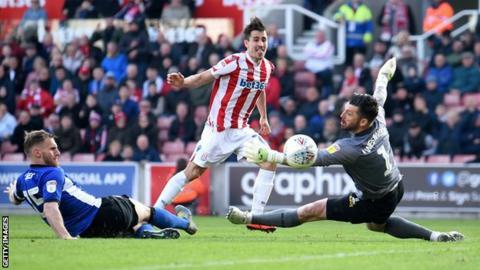 The point sees Stoke move above Swansea City into 14th place in the Championship, while Wednesday drop two places to 11th after Bristol City and Nottingham Forest both won and the Owls are now three points off the play-off places. The result means Stoke are the first team to record four consecutive goalless draws in the top four divisions of English football since Arsenal managed the feat in February 2009. Nathan Jones' side have scored just four goals in their last 11 matches and have failed to find the net in eight of those games. But they are unbeaten in their last eight matches having registered seven draws and one win - a 2-0 victory at home to Nottingham Forest on 2 March. "But I'm just a little bit frustrated as that's the fourth 0-0 on the trot and I don't know how that has happened. "I think the goal was offside, that might have changed the complexion of the game, but if one of our 12 opportunities had gone in, in any way, it would have been a different game." "The big chance, we think he (Boyd) was onside for the goal. The linesman took an eternity to make it (the decision), and when you look at it, I thought the rule was to benefit the attacker, not the other way. "So that was a big decision for us. That would have been nice for us to go 1-0 up, but with all the problems we've had, we'll take the draw. "Considering the problems we had with Rolando (Aarons) missing out, we're playing makeshift at the minute, if the truth be known. It's a point, but it's not particularly what we want." Match ends, Stoke City 0, Sheffield Wednesday 0. Second Half ends, Stoke City 0, Sheffield Wednesday 0. Corner, Sheffield Wednesday. Conceded by Thibaud Verlinden. Corner, Sheffield Wednesday. Conceded by Thomas Edwards. Substitution, Sheffield Wednesday. Marco Matias replaces Adam Reach. Attempt missed. Danny Batth (Stoke City) header from very close range is close, but misses to the left. Assisted by Tom Ince with a cross following a corner. Attempt blocked. Thibaud Verlinden (Stoke City) right footed shot from the left side of the box is blocked. Assisted by Bojan. Corner, Stoke City. Conceded by Dominic Iorfa. Tom Ince (Stoke City) is shown the yellow card for a bad foul. Liam Palmer (Sheffield Wednesday) wins a free kick on the left wing. Attempt saved. Tom Ince (Stoke City) right footed shot from a difficult angle on the right is saved in the centre of the goal. Assisted by Thomas Edwards with a through ball. Corner, Stoke City. Conceded by Sam Hutchinson. Attempt saved. Liam Palmer (Sheffield Wednesday) left footed shot from a difficult angle on the left is saved in the centre of the goal. Sam Winnall (Sheffield Wednesday) wins a free kick in the attacking half. Attempt missed. Sam Winnall (Sheffield Wednesday) header from the centre of the box misses to the left. Assisted by Atdhe Nuhiu with a headed pass. Attempt missed. Danny Batth (Stoke City) header from the centre of the box misses to the left. Assisted by Thibaud Verlinden with a cross. Corner, Stoke City. Conceded by Tom Lees. Substitution, Stoke City. Thibaud Verlinden replaces James McClean. Corner, Stoke City. Conceded by Barry Bannan. Substitution, Sheffield Wednesday. Atdhe Nuhiu replaces Gary Hooper. Attempt blocked. Tom Ince (Stoke City) left footed shot from the centre of the box is blocked. Assisted by Mame Biram Diouf. Substitution, Stoke City. Mame Biram Diouf replaces Benik Afobe. Attempt blocked. James McClean (Stoke City) right footed shot from outside the box is blocked. Assisted by Bojan.